The latest instalment in Novomatic’s Tales of Darkness series is Tales of Darkness: Lunar Eclipse. The highlight of this simple 6 reel, 10 payline video slot is the bonus round that awards up to 20 free spins complete with a special symbol that expands horizontally. Play this volatile game on all devices from between 10p and £100 per spin. Tales of Darkness: Lunar Eclipse is a typical Novomatic video slot. The visuals are rather basic but do the job well enough. The setting is a graveyard at night. Joining the A to J royal symbols are rings, crowns and a pair of glamorous female vampires. The vampire with the gold background is the most rewarding standard symbol, offering awards of up to 150 times your total bet if you land 6 across a payline. Joining the standard symbols is the full moon which is both the wild and the scatter. Land 3, 4, 5 or 6 of these and you’ll pocket 2, 10, 50 or 200 times your bet. You’ll also activate the game’s Free Games feature. On offer are 10 free spins. Before the feature starts, the Lunar Eclipse Bonus feature comes into play. 1 symbol is chosen at random – this special symbol will spin in full stacks which can hit on reels 2 and 5 only. If you land the special symbols on both of those reels on the same free spin, the symbols between them on reels 3 and 4 will also transform into the special symbol. This can lead to some big clusters of matching symbols and some tantalising winning potential. You can start a winner from right to left as well as left to right during the free spins. 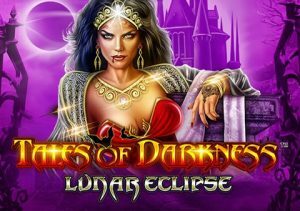 Tales of Darkness: Lunar Eclipse is a classic Novomatic video slot. It’s not especially easy on the eye but the visuals are perfectly serviceable. The gameplay is as simple as the design but it can pack a mighty payout punch thanks to the extremely high variance. In fact, we preferred this to the other video slots in the Tales of Darkness series thanks largely to that sky high volatility. If you’re a fan of games from Novomatic then Tales of Darkness: Lunar Eclipse delivers just what you’d expect. Simple, volatile and entertaining. What’s not to like? If you want vampires, Blood Suckers II from NetEnt is well worth playing.